Diane Kochilas is a Greek American cookbook author, celebrity chef, and cooking school owner. She has appeared on numerous TV programs (Martha Stewart Living, Throwdown! With Bobby Flay, and The Today Show to name a few) and she also runs the Glorious Greek Kitchen Cooking School on the Greek Island of Ikaria. In 2015, her book “Ikaria: Lessons of Food, Life & Longevity from the Greek Island Where People Forget to Die” won best cookbook in the IACP International Category. She is the author of 18 books on Greek and Mediterranean cuisine. In the fall of 2018, a companion book to My Greek Table will be released. Diane’s passion for food and her culture is evident, making her the perfect host of this show. 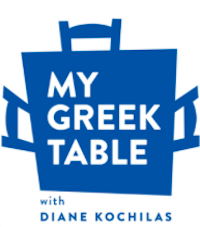 Join Diane Kochilas as she hosts the 13-part cooking-travel series My Greek Table. She will take you from the mountains to the Aegean islands introducing you to ancient flavors of Greece as well as modern food. Together you will explore Greek products such as: cheeses, traditional grains, herbal teas, Kalamata olives, and Greek extra virgin olive oil. Diane will cover the history, culture, and wines as well. Diane will take you along as she travels to Crete, Athens, Santorini, Volos to name a few as she meets with food and wine artisans and some of Greece’s best home cooks. Episodes include: “The World’s Most Famous Olive,” “Flavors For Longevity – Ikaria,” “Ancient Grains For Modern Cooks,” and “Greek Mountain Cheeses” to name a few. Each episode spotlights a specific area of Greek food, cooking, and location. You can view season 1 episodes and get recipes online here. My Greek Table will inspire you to make Greek meals yourself and make you want to visit Greece. The National Hellenic Society prides itself on creating a lasting network of Greek Americans to preserve their heritage. Their focus is on the promotion of the Hellenic heritage and the furtherance of Hellenic ideas through the sponsorship of scientific, educational, and charitable programs. By co-sponsoring programs like My Greek Table, they can expose their members, and many others, to the Greek history and culture they hope to keep alive. Everyone loves food and there’s no better way to expose people to the culture than through that. For Greeks who have never been to Greece, My Greek Table is the perfect inspiration to make a visit and experience everything is has to offer first hand. The National Hellenic Society strives to be a beacon for the promotion, understanding, and appreciation of the Hellenic heritage in the United States. If you love Greek food, you won’t want to My Greek Table! Let yourself get lost in all things Greek with each new episode. 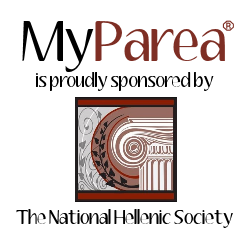 Join the MyParea social network!